In pre-Columbian Mesoamerica, the calendar originated by the Mayans included 260 days. The “tzolkin” or “division of days” displayed in today’s photo are described as ceremonial or mythological. 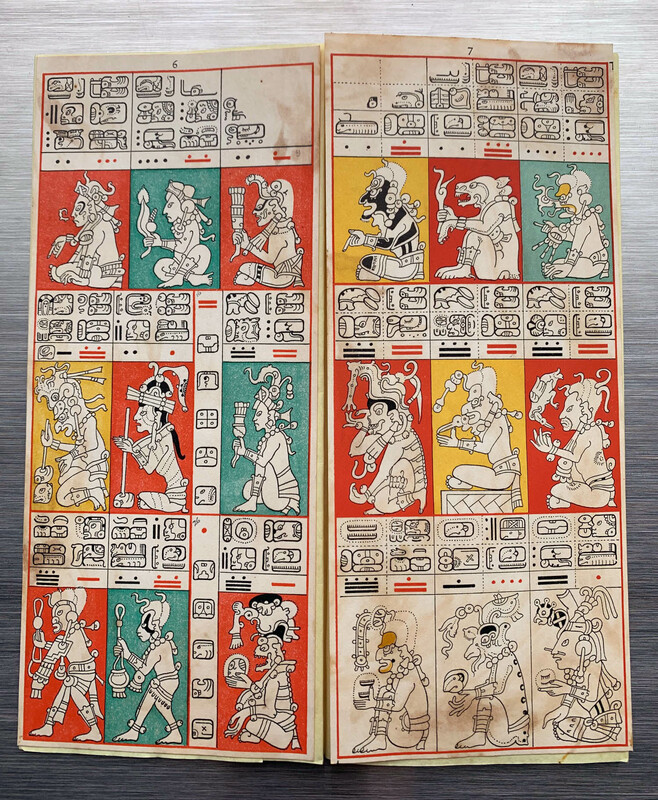 The calendar pages are part of a series of Mayan glyphs collected by Robert Hall Merrill (1881-1955). Merrill, an engineer and businessman, was a member of the Board of Trustees at Cranbrook Institute of Science from 1944-1953, as well as a consultant in the Anthropology department from 1948-1949. Tzolkins 6 and 7 from the Robert Hall Merrill Papers, ca 1922. Mary Miller, director of the Getty Research Institute, describes the Mesoamerican calendar as the oldest and most important calendar system (earliest evidence dating to 800-500 BCE). The original purpose of the 260-day calendar is unknown, but there are several theories. One theory is that the calendar is based on the mathematical operations for the numbers 20 and 13 (important numbers in the Mayan culture). The calendar combines a cycle of twenty named days with another cycle of thirteen numbers to produce 260 days. Each named day has a corresponding glyph as seen in the photo above. The glyphs are part of a series sent to Merrill by Edith Gates McComas, sister of Maya scholar, William Gates. This extraordinary material was transferred to Cranbrook Archives in 2016.